A common belief in the car world is that hybrid models are usually smaller vehicles with limited space and features. Nothing could be further from the truth when it comes to the 2017 Toyota Prius v, with 34.3 cubic feet of storage room* and ample legroom. Besides just the cargo area itself, the Prius v also has several storage compartments to keep the things you always keep with you, like a first aid kit, stowed out of the way. 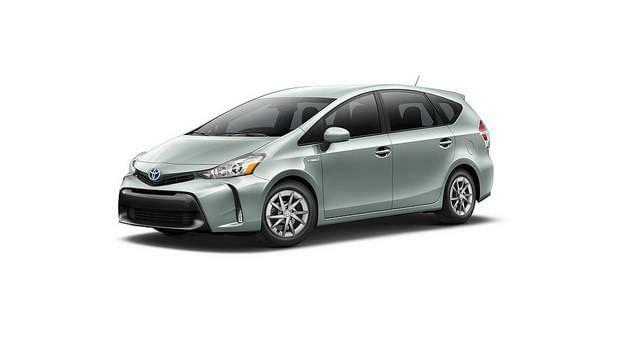 Driving a green car is just as comfortable as a standard vehicle, as can be seen in the Toyota Prius v’s available interior features. Adjustable seats make it easy for taller people to fit their legs inside, and available reclining rear seats will ensure quieter road trips when everyone is comfortable. For passengers that like a view, the Prius v is also available with a panoramic moonroof for a truly enjoyable ride. Let’s be real, one of the main reasons that you are considering the 2017 Toyota Prius v is because you’re looking to save money on gas and lower your impact on the environment. As such, this hybrid is powered by an ultra-efficient 1.8-liter four-cylinder ECVT hybrid engine with a permanent magnet AC synchronous motor that still achieves 105 lb-ft of torque and 134 horsepower. All of those fancy car terms all add up to the Prius v achieving an estimated 43/39/41 MPG City/Highway/Combined,** which is great considering its large wagon size.